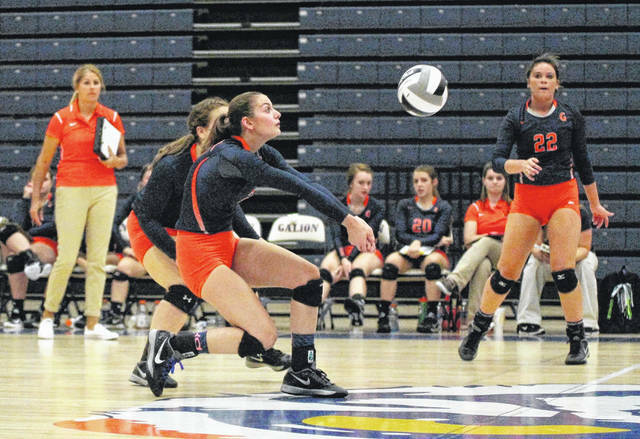 Galion, Colonel Crawford, Northmor and Crestline volleyball teams had their sectional tournament draws on Sunday, Oct. 8. With the stage set to begin their respective postseason runs, here is a breakdown of how it all win begin for these four teams. The Galion Lady Tigers and the Colonel Crawford Lady Eagles will both be in competition in the Attica District portion of the sectional tournament. GALION LADY TIGERS: Galion received a two-seed and a first-round bye in the upcoming tournament, set to begin on Tuesday, Oct. 17. With that said, the Lady Tigers will not play until Saturday, Oct. 21 at 7 p.m. and will welcome the winner of the contest between the seventh seeded Bucyrus Lady Redmen and the eighth-seeded Edison Chargers. Bucyrus and Edison will clash in Bucyrus on the 17th at 6:30 p.m., vying for a trip to Galion’s home gym on the 21st. COLONEL CRAWFORD LADY EAGLES: Crawford earned a six-seed in the Attica District and will host the No. 11 seed, the Margaretta Lady Polar Bears on Tuesday the 17th at 6:30 p.m. at Mac Morrison Gymnasium. The winner of this contest will then head to Ashland on the 21st to meet up with the Crestview Lady Cougars, the No. 3 seed, at 7 p.m.
NORTHMOR LADY GOLDEN KNIGHTS: Because of how the Delaware Districts work, Northmor finds themselves as the second-highest seed in their particular bracket. The Lady Golden Knights were awarded the No. 4 seed, just behind the difficult Pleasant Lady Spartans team at No. 3. Northmor will host their opening-round contest against the No. 22 seed, the Columbus Academy Lady Vikings on Tuesday, Oct. 17 at 6 p.m. If the Lady Knights are victorious on Tuesday, they will play host again on Saturday the 21st against the No. 20 seed, the Northridge Lady Vikings. CRESTLINE LADY BULLDOGS: The Lady Bulldogs team received the No. 9 seed in their respective bracket and will open postseason play on Monday, Oct. 16 at 6:30 p.m., at home, against a familiar opponent. Crestline will welcome fellow Mid-Buckeye Conference member, the Mansfield Christian Lady Flames to town after the Flames were awarded the No. 10 seed in the bracket. The winner of this contest will then advance to the next round which means a trip to New Washington and a meeting with the No. 2 seeded Buckeye Central Buckettes. The second-round match-up is set to take place on Thursday, Oct. 19 at 6:30 pm.